Denise told me she was introduced to knitting by her supervisor while working at her college’s science library in 2006. Knitting kept her company as she traveled to five countries for a year of independent research, and she’s been addicted ever since. You will most likely find her watching a lengthy Bollywood movie or Korean drama while knitting. 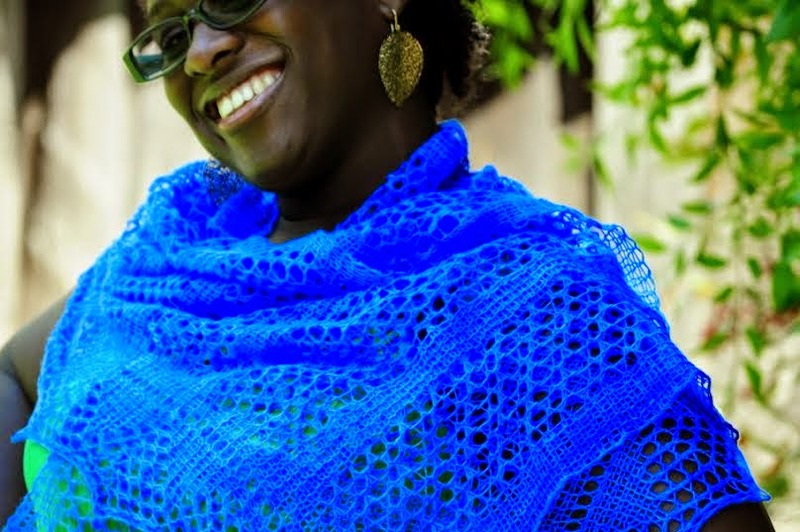 She's been published in Interweave Knits, Knitscene Accessories, Tangled online magazine, and in a pattern collection booklet exclusive to Joann's stores. You can find Denise here and here on Ravelry. I’m inspired by a lot of different things. Sometimes it’s the colors of the yarn I have in my stash, or the color combination of an outfit I see someone wearing. In the spring I’m always looking at flowers to check out the different color combinations that pop up, and see if I can replicate that in a pattern. I love texture, so anything that has a textural design that could potentially be knit inspires me. At the moment, it’s knitting a two-color fisherman rib stitch. I just read about it in the most recent Interweave Knits magazine, and I just had to try it out. I already have a free infinity scarf pattern that uses fisherman rib, so I’ve been making that same pattern but with the two colors, and I love it. In general, I love cabling, garter stitch, knitting in the round, and I think the Kitchener Stitch is the best invention ever! I definitely look at other designers’ work all the time. I’m always blown away by how creative some designers are, and how they are able to churn out so many refreshing patterns. I started designing by taking a very popular pattern by Cheryl Niamath, “Wisp” and seeing if I could replicate the look of her design using slightly different stitches. That gave me the confidence to actually start coming up with my own ideas for patterns. I’m only afraid that I’ll be influenced by other designs if I’m submitting a design for publication. During that process, I try my best not to look at other designs for inspiration. 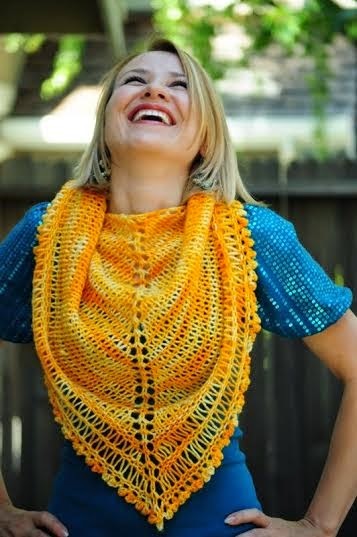 Otherwise, I’m always checking out other knitting designs. How do you feel about the so called controversy of "dumbing down" patterns for knitters? I actually didn’t know there was a controversy, so I had to do a quick Google search in order to answer this properly. I think knitting and a lot of other handicrafts were not mainstream for a while, unlike in the days when those skills were passed down in families. As such, those of us who are now picking up the craft may need more hand holding than expected. I come from a country with a very hot climate all year round, so knitting was not even an option until I moved to the US. People like me need more explanations because we don’t have the background already. I’m not sure it’s a dumbing down per se, and I can see how it might frustrate designers who have been in the field longer. That said, there are so many resources out there for anyone who wants to learn how to knit that, designers should not feel the need to explain every single detail. I’m a big fan of linking to a helpful online resource or post which often does a better job of explaining techniques than I could eg. 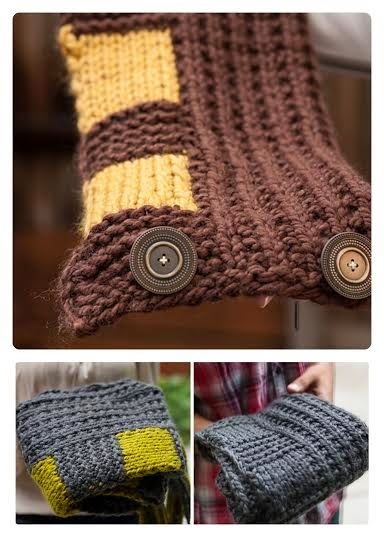 Woolly Wormhead’s tutorials on 1X1 and 2x1 cable cast ons. I don’t have a formal sample/test knitter program in place, but there are two people I’ve worked with and floated the idea by. I haven’t been designing as much recently, so I haven’t had much work to give them. Once I do, I’ll probably start with those two. Not formally, but I do reach out to designers I admire via email, Facebook and on Ravelry, such as Donna Druchanas and Joji Locatelli (to name a few). The internet has been fundamental to my business, as it’s enabled me to quickly start up an online shop, submit designs, conduct research, email publishers, editors and collaborators, and also improve my knitting and business skills through online classes. It’s been amazing. Yes I do, before I publish a pattern for sale. I don’t when publishing free patterns. Knitting IS how I maintain my life/work balance. :) I get such calm, peace and focus from working on a knitting project, or building out a part of my business. It can be really hard to accept the criticism, especially when you feel you’ve poured yourself into a pattern. I let it marinate for a while, and try to find out what I can take from it, especially if it’s constructive. Other times, I just let it go and keep working on other designs, because letting that negativity get to me could be detrimental to my creative process. Take the plunge, but make sure you have a plan and a back-up plan. Reach out to people you admire already in the business. They are often more than happy to help with advice and tips. You won’t know what you can do until you actually take that first step. Is your Bone Structure Small Meduim or Large? Custom Fit - If you think you can, you’re right! Where do Great Patterns Come From?